As Bob Stenzel and Darcy Cherry sat at a table in their Janesville, Wisc., home at dinnertime last week, a man with a gun entered their house through an unlocked door. “He had his gun drawn on us and demanded us to the ground, and repeatedly asked us, ‘Where’s the safe?’ and ‘Where is the money? '” Stenzel told KTRK. “I was just praying and praying and praying for us all to be safe,” Cherry added. 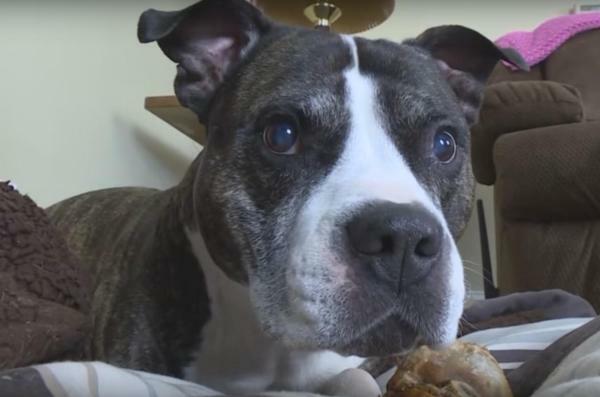 Levi, their 15-year-old, three-legged Pit Bull, began to growl and bark at the intruder. The man ran off, but not before shooting at Levi’s head. Fortunately, the bullet only grazed the top of Levi’s head and lodged in his shoulder. After being treated for his wounds, Levi the hero dog is doing well and expected to make a full recovery. Levi is “as loving as a dog can get,” according to GazetteXtra reporter Frank Schultz. This was actually the second time Levi was a hero. On a mountain hike with Cherry and her son in 2014, Levi took a fall off a steep trail. One of his legs was shattered and had to be amputated. Cherry told KTRK she believes Levi protected her son, who was walking right behind the dog, from falling first. Stenzel and Cherry rescued Levi when he was a puppy and had been abandoned in an apartment building. According to the Janesville Police Department, the armed robber was white, 5’7 to 5’8 tall with a slender build, and between 20 to 30 years old. Anyone with information is asked to call the police department at 608-755-3100 or Janesville Crime Stoppers at 608-756-3636.